High Hopes Stamps: Buddy Makes A Friend! Hi friends, Valentine's is my second favorite time of the year. I love using all shapes of pinks and reds. And you can't go wrong using glitter and ribbon even on masculine cards. For today I have a beautiful Valentine's card using "Buddy Makes A Friend"
I stamped my image with Memento Tuxedo black ink and colored with alcohol markers. I die cut my main panel using an scallop oval circle. Now my favorite part is using all my pretty embellishments. I used ribbon, pearls ribbon, diamond stickles, gelly roll white pen and puffy stickers. Hope you enjoyed today's card. 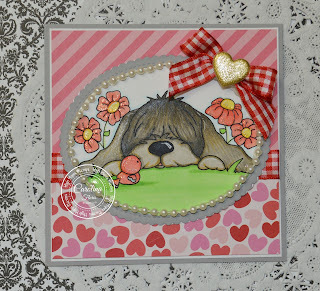 Here is another project I did using this stamp.